The travel through this care giving topic was more intense than I thought. I shed a few tears of my own in the sharing. Some emotions run very deep. with you over the last month. But I am ready to take a break. And while I am gone I will catch up with my blog reading. You will see me on your blogs getting caught up. Taking a few deep breaths. Through My Care Giver Eyes - The End? even when I think it is hopeless. When I first saw this quote it resonated with me. So many elements of the care giving life can seem hopeless. It can be very easy to just give up. After all, care giving cannot create good health, prevent disability or death. As they say, no one gets out of this life, alive! But it can provide a safety net, an improved quality of life and a dignity in aging for someone you love. It may seem hopeless if you see only the downward spiral, but care giving ... it is the right thing to do. Sharing my life as a care giver in my blog began as a fleeting thought. The idea popped into my head in a nano second and took root. I couldn't seem to shake it. Draft postings began to tumble out of me ... like a dam with a small unchecked leak that grows and grows until there is a flood. Still, I held off publishing that first posting. I held off for a long time. Who would be interested in the ramblings of a daughter doing what millions of other people have done before ... caring for an aging relative. There is nothing unique about my story. What value did it have except to me? And still I continued to write and write and write ... drafts only. But the idea of publishing the posts grew just as the idea of writing my story had grown. It felt like this idea was taking on a life of its own. As the drafts evolved, I knew I would publish something to my blog at some point. I finally published my first post with the thought that this writing was for me! The post would have an audience of one. Maybe a few family members might be interested. But the goal was to write for me. So I turned off the comments option. Soon I was getting private emails from others who saw themselves in my story and felt compelled to respond in the only way I allowed ... by personal email. The emails expressed a kind of kinship with my life. Some comments were so descriptive that I began to wonder if they, too, had a "leaky dam" that needed a little release. I began to understand that the barrier of "no comments" was unnecessary. Readers wanted to share. So I put the comments function back on the posts. Well, it is all out. The good and the bad. Is this the end? Hardly. I am still care giving. I am still living each and every day with my aging mother. This blog started with a theme provided by Mark Twain. by the things that you didn't do than by the ones you did do ..."
The quote, in its unedited form, references bold thinking and actions: "explore, dream, discover." I see my life right now as less than bold, but the quote is still valid. When all is said and done ... I will not be disappointed by the time I have devoted from my life in caring for my mother. I guess the flood of thoughts and words on this topic will slow a bit now. I have exhausted many of the backed up emotions and observations. The dam is no longer at flood stage. I am content to write on care giver things as they evolve. I want to thank all of you who followed this story and provided so many thoughtful comments both on the blog, in person, and through private emails. Many of you shared your own care giving experiences. It has been an honor for me to have such wonderful readers. I need to send a very grateful "thank you" to two blogging friends who invited me into their blogs and introduced me to their readers. Doris, from Hold My Hand, is a nursing home social worker. She professionally understood as well as any care giver the life experiences and emotions I shared. Her recognition helped me understand the value of my experience for anyone walking this road with an elderly parent. It was also my first "guest post" on another person's blog. Thank you, Doris. Another long time reader, Delores, from The Feathered Nest asked if she could introduce me to her readers through a post on her blog. I was touched and felt honored to be the topic of one of her posts. Delores, with her supportive comments and gentle wit, was a constant companion for me as I told this story. Thank you, Delores. This writing has given me some clarity and peace. So much of what I did over the last 5 years was reactive to life as I lived it. There was no plan, no method, no agenda. I responded from my gut. I did what I thought was right at the moment without giving it too much analysis. Now looking back - seeing the path I took without thinking - I see that my gut was right. Thankfully, I listened to my gut more than I listened to others. I think it worked out. At least so far. And I am also glad I finally listened to the mustard seed growing in me and started to write about this experience. These days are a bit lighter for me now that I have remembered ... and shared. Finally to my mother. Much is made of a woman's pain and struggle to give birth. But I sincerely believe that the real struggle comes after birthing. Molding a child into a normal functioning human while living a very difficult personal life is the best gift a mother can give her child. Every Tuesday morning I go to my "Sanity Group!" Well, that is what I call it. Everyone else calls it The Columbia Sip and Knit: Tuesday Morning Knitting Group! Here are some FOs (Finished Objects for those poor souls who have not discovered the joys of knitting, crocheting, and weaving). Every single Tuesday, someone has finished something!! This gorgeous sky blue tunic top is an eye-catcher for sure. We all were impressed with the beauty of the work and the style. Let me say something about this beautiful blanket. The technique used in this project is called double knitting. For those who are non-knitters, this technique produces a fabric that is two sided with colors reverse on the opposite side. While this technique doesn't sound like such a big deal, let me assure you ... IT IS! I have been a knitter for 14 years, and I haven't been able to successfully produce a pot holder using this technique. So you can be sure that a whole blanket is way beyond my skill level. Thankfully my self-esteme can survive this inadequacy. This same knitter finished a beautiful sweater just recently. She just seems to pump these project out. Maybe now is a good time to mention that I finished a pair of socks that I started in January 2010 ... finished them just last week. Yeah, me! What is hard to see in my picture is that this yarn has a bit of sparkle to it. Very appealing. We don't limit ourselves to just knitting. Here is a project called pin weaving. This technique produces a textured picture from the use of different kinds of yarns. In the picture on the left you can see each individual pin used to anchor the yarns used. I usually try to post finished objects only, but this project was so unusual and beautiful, I wanted to share to the process. This stunning scarf was a perfect match for clothes I was wearing that day. I couldn't seem to separate the scarf from its creator based on that reason alone. And this blanket is not only striking in its color and design ... it is massive! A very impressive piece of work, indeed. Oh forget it. My socks can't hold a candle to something this large!!! So some of you may be wondering why my knitted socks are not part of this array of finished objects. Ok, ok. I'll take a picture and post it soon ... promise! After all, I am sure I hold the record for taking the longest period of time to complete the shortest project!! A scary place, the future. For mom the path she seems to be following is predictable ... new medical problems, more disability, less mental engagement, more hands-on care. During her last hospitalization and rehab, she slipped quite a bit. I worried that she had passed some invisible line that required more professional care than I could provide at home. But I resisted because in my mind we were still dealing with an illness. You get better from an illness. You may still have chronic medical conditions, but you can recover from the episodic illness that made you weak, and you get well enough to do the things you once could. And she did improve some. But questions still remain. Will mom's future hold an assisted living or a nursing home? Will her health continue to hold stable or will she slide further downward? How long can we manage her needs in our home? These issues seem to glide one into the other in a massive gray way. There never seems to be a definitive line in the sand that says ... "Now we must take this next step." I worry about the impact of mom's future on myself. How long can I physically continue to manage her declining condition? Will I be able to separate her needs adequately from my own? Could I survive my internal turmoil of placing her in another living environment that is not my home? The final assault will be her death. I can't imagine her absence from my life after 64 years. I can't begin to fathom the size of the void that will be left by her passing. I have read there is a relief and a kind of freedom at this passing. But do those feelings balance the loss and the void her death will cause in my life? Will I ever be normal again or will I have to search for a "new normal" for my own life? And what of my own aging? I watch her struggle and I think ... you are looking at yourself 20-30 years into the future. Where will I be physically and mentally at 85? I know that some of mom's condition is the result of her personal choices over the last 20 years. But the aging process is not easy for some and hard for others. The aging process is hard for everyone no matter what you do to prevent it. Yes, the future is a scary place. I avoid talking about religion and politics. Both topics are polarizing. People typically have strong views about both, and those views are not generally changed by discussion. But I have touched on the topic of faith in my care giving series. Maybe a few more comments now won't hurt. I was raised a practicing Catholic. I owe a great deal of my good education to the Catholic Nuns who were my teachers from grades 1 to 8. And I believe my morality and views on life can be traced back to my religious upbringing. As an adult, I like to think of myself as a good person, treating others as I would like to be treated, finding the good in everyone, keeping an open mind regarding others ideas and positions ... and I still believe there is a God. But I am not as comfortable with an organized religion as I was in my youth. In fact, against some of the precepts of my religious education, I do not believe that any one religion has the total attention of God to the exclusion of everyone else. Mom still is a strong traditional Catholic. I take mom to Mass every Sunday. Mom's faith is a vital part of who she is, and she has many social contacts at church. She believes in all the traditions and the rituals. She has lived her whole life never questioning anything about her religion. Looking back mom's relationship with her church and God, I can see how it sustained her. Her favorite saint was always St. Jude, Patron Saint of Hopeless Causes. Hopeless Causes. A sad indication of how she felt about her life for so long. I guess in the end St. Jude came through for her. Dad died when mom was in her 40s. After he was gone, she finally was able to build a good life for herself. Work, travel, friends, hobbies - she finally a chance to live normally. But 24 years is a long time to live with such unhappiness. I often say, I wouldn't have put up with my dad, but put in her shoes with 2 young children, no job and no family support nearby ... who knows what I would have done. Mom's faith was her lifeline, and St. Jude finally paid attention to her prayers. I can't help but wonder if she was just waiting and waiting for some divine intervention. Could things have been different if she took some kind of action. Still, 24 years ... "hopeless causes" ... makes me sad even to this day. I guess I am more of a questioner! As an adult, when I thought about God, I didn't find comfort and answers in organized religion. I believe that we all were created by God with intelligence, wit and strength, and we are expected to use those gifts as we live our lives. To sit back and wait for Him to fix things is to ignore the tools He gave us to fix things ourselves. Still ... when I have lost strength and feel I can't take another step ... I turn to prayer. So I do believe in God, the same God that mom believes in ... and I think He is fine with both our approaches. I don't think He judges on how we believe, just as long as we believe. A well known poem called Footprints speaks most closely to how I felt this last year has been for me and my relationship with God. and I questioned the Lord about it. 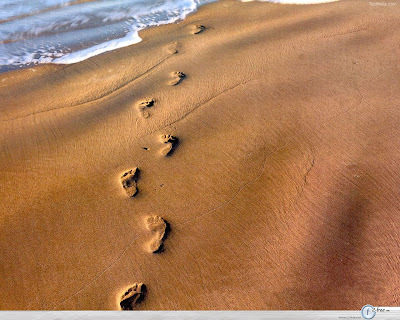 there is only one set of footprints." I love you and I would never, never leave you during your times of trial and suffering. I guess I got carried a few times this year. I am not good at it. Type A personalities typically aren't good at asking for help or delegating. Care giving, however, teaches you the limits of your energy. And no matter what your personality type, eventually, you find yourself in over your head. For me it is a terrible position to be in ... to ask for help. In fact, the last time I stretched to the breaking point, my husband insisted that I ask for help. But if you ask for help and you get resistance or excuses, it confirms that you shouldn't have asked in the first place. If you ask for help and it is interpreted as a rescue from your decisions, that is deadly. The truth is that you cannot do this job alone. Even in elder care institutions, they have 3 eight hour shifts of helping hands. Thankfully, I have a generous, loving and strong network. To start with my husband, whose every day life was most affected by my choices, continues to support me. I am sure when he said his vows 42 years ago, it didn't include living with his mother-in-law. It is not his nature to be a care giver, and the frustrations of life for him are considerable at times. But how do you project 42 years into the future what life will be like and what will be asked of you. The fact he is still standing solidly by my side after 5 difficult years I guess means he really meant "until death do us part." How great is that! And my adult children have been a help beyond measure. They don't wait to be asked. They see a need and jump right in. They really should be saving energy for their own parents 20 years from now ... meaning me, of course! :-) I plan to be a hand full when I am mom's age. I have already warned them. But seriously, my adult children have already shown sensitivity and commitment without my asking. They know first hand how hard this is for me at times. I am proud to call them my kids. Then there are friends! I won't name names, but they know who they are. Two individuals readily come to mind because of recent events. There are others, but this blog can only hold so much. One friend is dealing with her own husband's critical and complex health issues, but she has walked this parent care giving path before me. She has offer valuable insights by email time and time again. Never judgemental, she is supportive and caring to my thoughts and frustrations. She constantly reminds me how "normal" all my responses are - even the bad ones. My knitting friend ... you are golden! And then there is another good friend from my former professional life, who I recently saw after an absence. I tried to pick her brain for home companion recommendations, since she too has been a care giver for her grandmother and husband. She responded so quickly to personally help, that I couldn't believe it: "I would love to do this for you and your mom!" She remembered mom from years ago when mom went to doctor appointments independently. This friend's generous and spontaneous offer had me in tears as I stood in her office. She demanded that I stop or she would be in tears, too. Mom remembers this lovely lady, and they spent their first afternoon together yesterday. It went exceeding well from both of them. Knowing that mom is in my friend's capable hands lifted about 10 pounds off my shoulders. Thank you my dear friend from the bottom of my heart. The website Caring.com has been most interesting and was discovered by my husband. A recent story on Care Giver Stress and how to deal with it seemed timely. There is also a free online newsletter. It is amazing how many times I see myself in these articles. Another suggestion I have yet to seek out is a book called Caring For Mother: The Long Goodbye by Virginia Stem Owens. I plan to order it - and review it for this series of posts at some future date. At times I feel I am living that title. I have also found some interesting pod casts on the subject of elder care. Aging Parents Pod Cast can be found at iTunes and at their website Aging Parents.com. I haven't really explored the web site, but I have listened to a number of the pod casts. Five years ago I would have found this information very helpful. I have learned a lot already through experience, but there is still new information to be found. Of course, you have to read/listen critically and determine which information is valid for your situation. Recently I discovered the large support system sitting out there for the asking .... the blogging community. While it is true that bloggers are distant "friends", they have frequently boosted my mood and energy with words of encouragement and advice. And the sharing of personal care giving experiences has been very touching. In the end when all is said and done, I am the main support for mom ... she looks to me no matter what actions I take. But "help" is critical to make sure I can still be standing for as long as she needs me. Five years ago, I started on this caregiver path just as enthusiastically as the crusaders did when marching to the Holy Lands hundreds of years ago. Really, I know that statement sounds ridiculous, but, it is true. I had energy and desire, I figuratively fought a lot of battles since those early days, and I have been scarred and depleted by them. Just like a crusader. And I have learned very important lessons that I would have thought impossible in the beginning. Sometimes I just have to "let go". Care giving is a marathon, not a sprint. As mom's care required more of my time and energy I began to see the wisdom of picking my battles carefully. Believe me, that was a very hard lesson to learn. Type A personalities (like myself) hate to leave anything undone, or incomplete, or unresolved. "Yes, you will start this antibiotic. I won't take no for an answer." "We will get a stair lift. My house, my stairs, my decision." "You will go to the hospital because it isn't acceptable to sit here so short of breath and unable to walk." You get the picture. Health and safety issues are my battle grounds. Recently, however, I have taken a more back-seat approach to other lower priority activities. I still believe these priorities are important. I used to fuss at her about doing them. But out of respect for her and to allow some decision making over her own life, I have backed off - let go - on other stuff. The biggest "letting go" has been her physical activity. This year it has dropped significantly. After a spring hospital discharge, she exercised to get her strength back. She walked every day. She practiced climbing steps. For months I had a schedule, and I made sure she did it all. She did improve greatly. But lately she has backed off on being active. If I don't remind her, she doesn't do it. I have come to believe that there are some things in life you just have to want for yourself. Keeping physically active is one of them. Occasionally I remind her, like today, that if she doesn't keep active, she will get weak - too weak to live in a house with this many steps. Sometimes that works and sometimes that doesn't. But to spend both our lives pushing for an activity level that she is not personally committed to doing is not good for either of us. So I remind her, but I do not badger her. I have let this battle go. Another "letting go" relates to mental stimulation. She seems quite content to sit and do nothing. When I began to see this trend toward mental idleness, it bothered me. In checking with her doctor I learned that the need for mental stimulation reduces in some elderly. I should not assume she is unhappy in her idleness. Sometimes I watch her sitting outside. In the middle of the day there are no passing cars or people walking about. Maybe there is a squirrel or two, but it is pretty quiet on my end of the street. And still she seems content to look around and be with her thoughts. I prompt her with puzzles and books, remind her of TV shows she enjoys, chores she needs to do. I suggest, but don't insist that she keep busy. Here is another battle I have let go. Several years ago I might have felt that "letting go" was just the same as "giving up." I would require that she continue to keep active mentally and physically. She would agree and make an effort to do whatever I was suggesting. But how much of that was my agenda being forced on her? Understanding and accepting what mom seems to want for herself has been an evolution for me. As I stand here in my 64 year old body, I know that I want more for myself. More movement, more thinking, more productive activities, more of everything. I believe in the "use it or loose it" way of thinking. But does that mean that my way is the only right way? I think "letting go" of what I want is a way of respecting her choices - even if they aren't my choices. Of course, I cannot ignore the fact that her choices will lead eventually to more disability. Inactivity both physically and mentally will lead inevitably to more inactivity. It is a vicious circle. This, however, is her path to choose. Sometimes I ponder what path I will choose when my body is not 64 but 84! Will I be able to live up to my own standards? How much of a crusader will I be for my own aging? Or maybe 13, but certainly not more than 14 ... in my mother's eyes. This was a new development as of 5 years ago. Until mom's move into my home I was a "married adult" in her eyes. I moved out of the status of a "child" at 22 years old on my wedding day. It almost seemed as if on that day, she viewed me differently. I was now independent. My future was with another. Her knowledge of my activities, my thoughts, and my goals became seriously limited. She had launched me into life on my own and then "let go!" But she never inserted herself into my life. If she made judgements about my actions she never shared them, never gave me advice unless I asked for it. None of that. Our lives were now separate and she moved on with her life. Of course, during my first year as a young married woman, she was still living with my dad. His alcoholism was a daily cross she carried. I also suspect that their own personal history as a young married couple impacted how they treated me. Somehow I became aware that the move to Maryland so long ago was partly due to too much family in their lives. Marriage seemed to be the dividing line in my mother's eyes for when you became an adult. Getting engaged was the first step in that direction. And that conversation rings clear in my mind as if it was yesterday. Mom and I were walking our dog, Lucky, in front of our house. I turned to her and said, "He has asked me to marry him, and I said yes." There was no congratulatory comments, no expressions of love, no joyful response for my happiness. She was quiet for a moment and then said: "You must be sure, because once you are married, I won't be able to help if things don't work out." I was 20 at the time. I remember feeling a sense of disappointment in her response. Looking back I can see this statement was a peek into her own past. Things didn't work out very well for mom after she married, she didn't have any help from her family, friends, or her church. When she married, she was on her own. If her married life had been different, would she have responded differently to me? Maybe. I can't imagine ever saying those words to one my children. I would extend a helping hand as long as there was breath in my body. But my married experience was different from hers ... mine was normal. I know now she was dealing with a lot then. But at the time I was too young to be understanding or reflective. I feel badly that I expected more. So as a married adult, she had a hands-off policy with me. I was mature, someone's wife, and taking on adult roles. She had done her job with her first child, and she moved on with her life. That all changed when she moved into our house five years ago. It is hard to step back into being a child when you have been an adult from age 22 to 59. It is hard to accept direction on activities that you have been doing successfully for 37 years. It is hard to respond in an adult fashion to questions that imply you may not be able to handle the everyday functions of your own life and household, even though you have done so without help ... did you lock your car? don't forget to lock up the house when you go to bed? you will be home before dark - won't you? who called and what did they want? And while I was being downgraded as an adult, my husband was reaching nose-bleed heights as an adult. In my mom's world, women were secondary and subservient, men were important and in charge. It was her life experience and something she didn't outgrow as she matured. It is an element of her personality that gets in the way daily for both of us. So now my husband was the adult in our house. And technically she probably thought of it as "his" house - not "our" house. His opinion was very important. His littlest actions were noticed, remarked on and thanked. She seemed unaware that we were a couple who handled many of life tasks equally. It was no matter that I did everything for her ... I was 14! I remember one birthday conversation that demonstrates this thinking better than any recitation of examples. Mom used to take us out to dinner for our birthdays. Every year, she would begin with date setting and then selecting a restaurant. One year on my birthday she reminded me that we needed to set a date. We did. Then she asked me "Where do you think Mike wants to go?" I paused, letting that statement hang in the air a bit. Then I responded ... "Well, since it is my birthday, I don't care where he wants to go." There was another pause while my response hung in the air. Then she started to laugh a bit. We both laughed, but it was how her mind worked. In every situation, what did the man want to do? I do understand where her perception of life came from. But it was impossible for me to reject the whole of my adult life and step back into the 1950s role of a house wife. As my age and equality dropped in her eyes, there was more friction between us. I have often remarked how it was that mom managed to raise 2 daughters who were so entirely different from herself in attitude and independence. Generational differences can put great pressures on parent-child relationships. But, thankfully, over the 6 months I have seen her attitudes soften a bit. The full impact of her health issues and physical limitations have made an impression. She can't help but notice, that when life has covered her from head to foot in lemons ... I was the one continuously standing at her side batting those lemons away. I think she recognizes that now. But old habits die hard. It is still a constant battle. So let me revised my initial statement ... today I think I have grown to about ... oh, maybe 17! as long as I didn't look in the mirror! Through My Care Giver Eyes - Salt! Mom emerged from her earlier hospitalizations with a few new diagnoses, new medications and dietary changes. But I get ahead of myself!! Back to the beginning ... way back. Back before she moved in with me, before she retired, before I got married - back when mom cooked for her family. As my my son would say, "back when dirt was invented!" There was no such thing as "dietary restrictions." If it tasted good, you ate it. Nothing was harmful or worrisome. After all, cigarettes were recommend by doctors as a way to calm nerves. Lard was commonly used. A paternal uncle of mine was a butcher, and the story goes that my aunt baked with chicken fat. She made to-die-for baked goods ... which my uncle did - die ... from a heart attack. And salt was never a problem then. We were raised with salt. To this day, I still believe salt isn't a seasoning, but a food group. Salt is a gift of the Gods!! Salt and I are still very good friends. Even after all the negative publicity about salt and blood pressure, I still use salt. That why diuretics were invented, right? Now that I have set the stage ... I'll continue. Four years ago at mom's first hospital discharge, the nurse gave her instructions: low salt and low fat diet. I stopped the nurse in her recitation. I informed her that mom lived with me, that she had made it to the great age of 81 (at that point), and that as far as I was concerned, she could eat whatever she wanted. The nurse smiled at me and graciously agreed ... but she had to document in the chart that she had said these words: "low salt and low fat diet". Ok, I didn't want to get in the way of someone doing their job. So mom and I continued blissfully down the old salt road. Every hospital discharge included the same cautions - "low salt and low fat diet". And then April 2011 came. She got short of breath. We didn't realize what was causing it. We went to the ER. Tests were performed, and we waited for results. While we waited, mom and I were hungry. It was right before lunch. They don't serve lunch in the ER. I went out to the snack machine in the lobby - salty and sweet were all they had. If they had carrots and celery I would have ... well, no, you wouldn't believe that. We munched together. Those Doritos were so yummy. We each had our own bag. I am sure I licked my fingers. We finished every last piece. I "shot a few baskets" with the Doritos bags in the trash. We waited some more for test results. Then the doctor arrived with the diagnosis. She had fluid around her lungs, and that was why she was short of breath. They would start her on IV diuretics right away and admit her to the hospital. And then he asked about her diet and salt! The crumpled Doritos bags stared back at me from the trash can. I closed my eyes. Then I looked back at the trash, willing those bags to be somewhere else. Then I looked at mom. She had not put two and two together. Those yummy Doritos had to be 85% salt. Thankfully she did not rat me out to the doctor, and the doctor didn't look into the trash! She had fluid retention. It hospitalized her. Salt was hurting her now. Mom's health required less salt. Mom and salt must part ways. Like a fictional cartoon character, I responded heroically! We proceeded salt free for about 2 months. I bought low salt and no salt versions of all her favorites. I adjusted my recipes. She unenthusiastically ate what I gave her, but she complied ... at least while I was watching. But she got salt back in her diet again! Life is too short to cut out all simple pleasures. You would know that if you saw her face with that chunky salted pretzel. Grimmy, or Pug-a-pot-0-mous, or Grimples, or Grimple-stilt-skin ... for short. This posting shows a lot of pictures of my Grand-dog, Grimace, taking a leak! If you stood still long enough, you would be marked by his ever full bladder. I once apologized to a little girl's mother for Grimmy doing exactly that to her child. I still remember Grimace's look when I scolded him. "Really, Gram, she was sitting there so quietly. I thought she was a Red Wood." Grimace is my "middle" grand dog. His place in the pack is ahead of Milo, but behind Meathead. Technically he is the oldest of the three dogs ... but dogs don't rank themselves by age. Grimace is a Pug. A very large Pug by Pug standards. He was 3 years old when my son adopted him from Pug Rescue. The little we know of his background goes like this: he and his brother were having problems getting along, the couple that owned them were expecting a baby, and they decided to give up both dogs. Be devoted. And he is. We joke that Grimmy thinks that I own him and he just visits with his papa. It is probably more truth than joke. Leave your mark on the world. Leave it on this tree, this blade of grass, this chair, this wall, this person, this fence, this dog (Meathead doesn't seem to mind an occasional sprinkle on his head. Go figure. ), this car, this trash, this ... anything you can name. That is why he is the proud owner of "pooch pants", or dog diapers ... or, as my son likes to call them, "camp trousers." So today I thought I would take you on our walk together. Every sleep over night, Grimace and Grandma go for a long morning walk together. Sometimes Milo comes, but on this day it was just Grimmy and Gram ("the way it is meant to be" says Grimmy). On morning walks Grimace gets to chose the direction. So here we are checking out this tree. I swear they are different trees. They may look exactly the same to you, but if you had a dog's nose, you would know they are as different as horses and pumpkins. We are lucky to have a small park near by. The entrance is a stopping place for all the dogs of the neighborhood. taking this 40 minute walk without breathing. "Grandma, I love our morning walks." Sometimes I make him stop for a rest. He is getting up in years. Look at the dear gray face. Even the tips of his ears are gray. It makes me sad because it reminds me that our years together are becoming shorter! Time to be moving on. Usually the walk back up the stairs to the house is a slow climb. and some couch time is a priority. After all, the bladder is empty. Grandma and Grimace are BFFs ... but I have said that before! Although it might not seem so, we had many joyful moments. Maybe these little jewels were more brilliant because the time surrounding them was so hard. Like stars in the massive night sky - those joy filled times were intensely bright. Handing me the list of local facilities, she finally looked at me. I think my face told the story. I was desperately tired, worried, and anxious, and I knew mom wanted to go home. I wanted her to go home. I knew she couldn't. I stared at the list. I would have to explain why she couldn't go home after the social worker left. And I had to be able to do this without letting mom see how upset and sick I was at the thought of taking her to a nursing home for rehab. The social worker immediately took a softer, more interested attitude, but soon left. It was 4:00 in the afternoon. Time was short. I needed to leave right away to see some of these places. Facing mom to explain the situation was the hardest thing I have ever done! Until that moment I had never prayed for strength. I always found it within me. Always. But in that moment, looking into mom's disappointed eyes, I made a silent prayer. I hoped someone was listening. She took the news as well as could be expected. I promised her I would be back in time to spend the night. I left with the list keeping my emotions in check until I reached my car. It was a terrible feeling leaving her alone for the first time in all her hospitalizations ... alone with her thoughts and the uncertainty of what was happening next. I can't even imagine what she thought about while I was gone. Mom fears nursing homes. I knew this. I consistently used the label "rehab center" rather than nursing home. She never caught on to the difference. And maybe there wasn't a difference in her mind. When nurses would do their routine mental awareness checks - one of the questions they ask is - Do you know where you are? Sometimes mom would answer - in my daughter's home. Sometimes she would answer - in a nursing home. Those were the only two realities she had - and she didn't want to be in a nursing home. Unfortunately in our area, rehab took place in nursing homes ... and that is where I was going to place her. My heart was desperately heavy. The ride home was hard. Crying and driving is not safe. I called my husband and explained why I was coming home. Would he please come with me tonight to see these nursing facilities because I sincerely didn't think I could do this alone. Now I know it sounds odd ... most normal marriages you wouldn't have to ask. It would be assumed. But my husband has failing eye sight. He seldom goes out after dark because his night vision is so very poor. It was December, and by 5:00 pm we would have darkness. This would be hard for him. He responded immediately - of course he would come! I knew he would say yes, but I hated to ask. I wanted to be able to do this on my own but I couldn't. I hated putting my husband in the uncomfortable position of appearing disabled, but I had to. After a month of terrible happenings, I discovered there was nothing left inside me. I needed help! We selected several places, called for appointments and mapped out our route. I will never forget how much better I felt with him beside me. He did have problems each time we left the car and walked through the darkness to the entrances, but he was there - I could cope with this distasteful task, if he was there. The nursing facilities we visited ranged from bad to acceptable. One place was so terrible that I thought about walking out without completing the tour. But the good manners my mother had instilled in me prevailed, and we stayed. I asked all my questions and acted as if nothing was wrong. We left as soon as possible. As we were leaving that facility my husband jokingly said, "So ... I guess this place isn't on your short list." There was no humor in my response. "This place is a big, fat NO. It isn't on my short list for a dog." Apparently I still did have some fight left in me - if you dig deep enough, it is there. But I was sad for the poor souls who were receiving care there. I remember thinking, if this is my only choice, mom will be discharged to my home. I will figure out how to handle her debilitated condition then. I believe my silent prayer was heard because many times that evening, as we looked at places I didn't want to think about, I could feel strength returning. After the evening tours, I had 2 places selected, but I needed 3. And truthfully, there was only one place where I could take mom and be able to sleep well at night myself. I guess the prayer I uttered so silently earlier in the evening was still echoing in His ears. My daughter called with a suggestion that I check out Brook Grove Retirement Community. She knew from her own residents that Brook Grove was a highly regarded rehab facility. I might have trouble getting mom placed there because they are always full. It was worth a try. The next morning I visited this wonderful facility. After the tour I knew, this was the place. And not only did they have room for her, she got a private room! It was 10 days before Christmas, they had space! Joyful moments don't come any better. I sat in Brooke Grove parking lot after my tour and called the hospital social worker with my choices - I gave her two. I was ready for a fight about giving the third, but it never came. Maybe she remembered me and took pity. Then I called my daughter to thank her. As I was dialing her phone number I kept repeating over and over to myself ... do not cry, do not cry, do not cry! She wasn't available so I had to leave a message. I breathed a small sigh of relief that I could talk to a machine. I might be able to leave a message without tears. I got almost all the way through it when my voice broke. At least this time, they were tears of joy - total, complete, utter joy. I returned to the hospital that morning, and within hours Mom was discharged. It was quick. And she was transferred by ambulance that evening to Brooke Grove (my post and pictures of this lovely place). My son volunteered to spend the first night with his grandmother so that I could go home and get some sleep. I will never forget his smiling face as he sprightly walked into his grandmother room at 9:30 pm. His back pack was slung over his shoulder, he greeted his grandmother with, "So Gram, I understand that you and I are going to have a sleep over together." I was never prouder of the young man he had become. And my dear mother, who had been through hell and back that month, smiled back at him and said, "I wouldn't tell too many of your friends about this sleep over in a nursing home with your Grandmother." She apparently was not down yet! My sister spent the second night with mom, and I spent the third. I felt comfortable leaving her alone by the fourth night. I knew she wouldn't be disoriented waking in the middle of the night. I knew she could call for help. And most importantly, I knew the staff would be there. She was in good hands. She recovered quickly and was home for Christmas. It was an unusual Christmas for us. She came home on December 23. When she walked in the door, there was no decorated Christmas tree, no Christmas cookies, no presents wrapped, (some were not even purchased), but mom celebrated the holiday at home. My daughter came home and between us we got the tree up and pulled together a semblance of holiday cheer. It was the best Christmas I can ever remember! There have been other bright stars in my dark sky since that hard December, but this one has shown as brightly as the North Star. In fact, it is my North Star, because nothing brought me so low or raised me so high since then. And I learned a lesson about prayer.